Sub-floor condensation is one of those things you may see referred to in surveyors reports but are not really aware of what it means. It is an issue that generally remains unseen until a problem with the floor arises. Well, firstly, it is important to understand what the term “sub-floor” is actually referring to. The sub-floor area, or sub-floor void (as it is often referred to) is the space beneath a ground floor, suspended timber floor. The actual size of this void – or space – can vary significantly from virtually nothing, where floor joists are in contact the substrate beneath, to something which you could, although probably would never want to, crawl under. The norm for this sort of space is somewhere in-between and is often found to be around 300-400mm deep; from the undersides of the floor boards to the substrate beneath. Once again, the substrate – or oversite – beneath is also not consistent and can be simply the soil beneath the building, a mixture of back-filled dry ballast, or, in later times, can also be a concrete mix. One of the things you should see around the outside of a house which has suspended timber floors are sub-floor air-bricks. They are, or should be, fairly regularly spaced and their purpose is to allow air ventilation within the sub-floor void. This air ventilation is very important, as it helps to keep the area within the void relatively dry. This is important because when the timber joists, wall-plates and floor boards are kept suitably dry (below 16-18% mc) they are generally not at risk of timber decay. That is the ideal! However, unfortunately, things change over the years which can include flower beds being built up against external walls, paths around the house being re-laid over old paths etc. This can often lead to the sub-floor air-bricks being either partially or totally obscured, which means the previously good air-flow under the floor is now non-existent. Other reasons for sub-floor condensation occurring can be leaking plumbing pipes within the sub-floor void which can lead to excess water and humidity within the sub-floor void. This can be the start of problems; especially where the over-site is basically soil, as it is in many Victorian houses. 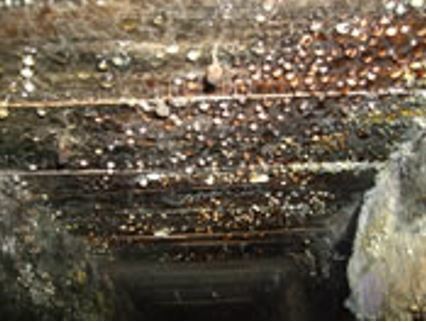 Where the soil, or other subsite material, is damp and that dampness cannot be dried by simple air ventilation, the humidity beneath the floor rises and moisture vapour quickly starts to condense and this is often found to occur on the undersides of the floor timbers. The two photographs indicate this very well. 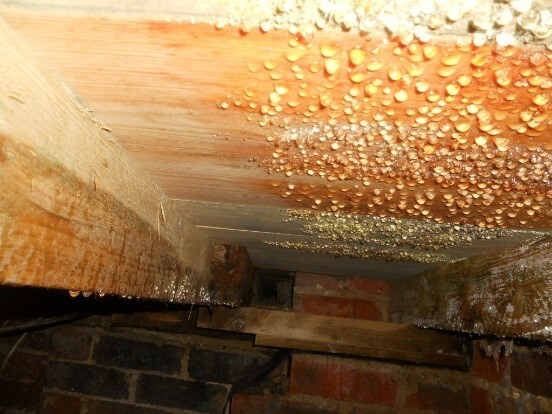 When this happens over prolonged periods, it can – and often does – lead to outbreaks of fungal decay by either, or both Wet Rot or Dry Rot. Both of which can lead to the need for expensive remedial treatment including replacement of whole, or part of floor structures. One thing which we have found to be the cause of very bad sub-floor condensation, which has led to serious Dry Rot attacks, is where insulation materials have been fitted underneath floor-boards. On occasions, we have also found under-floor heating has been installed above the floor-boards and Dry Rot attacks have been significant. In such cases, interstitial condensation – this is condensation between two layers – has built-up between the undersides of the floor-boards and insulation materials with nowhere for the condensation water to dry. As stated earlier, it is really important that buildings with suspended timber floors at ground level are properly ventilated so that the likelihood of sub-floor condensation (and it’s effects) is minimised.